The Siege of Derry was the first major event in the Williamite War in Ireland. The siege was preceded by a first attempt against the town by Jacobite forces on 7 December 1688 that was foiled when 13 apprentices shut the gates. This was an act of rebellion against James II. The second attempt began when James II himself appeared before the walls on 18 April 1689 with an Irish army lead by Jacobite and French officers. The town was summoned to surrender but refused. The siege began. The besiegers tried to storm the city but all attacks failed. They then resorted to starving it out. They raised the siege and left when ships bringing food broke through to the town. The siege lasted 105 days from 18 April 1689 to 1 August. It is commemorated yearly by the protestant community. The "Glorious Revolution" overthrew James II, king of England and Ireland and replaced him with William of Orange, who landed in England on 5 November 1688. James fled to France in December. Louis XIV, king of France, received James well, because he needed him and his supporters, the Jacobites, as allies in the Nine Years' War, which he had just started by investing Philippsburg on 27 September 1688 and declaring war on the Dutch Republic on 6/16 November. [a] On 7 May 1689 England declared war on France, quite belatedly, as French officers and experts had already been fighting William's troops at Derry before that time. Louis XIV also had revoked the Edict of Nantes in 1685, which sent Huguenot refugees all over northern Europe and rekindled fears of persecution in protestant communities. In Scotland, the privy council asked William to assume responsibility for the government in January 1689, and William and Mary were formally offered the Scottish throne in March. However, many Scottish people, especially among the Highland clans, had sympathies for the Jacobite cause. Ireland, however, was still ruled by Richard Talbot, Earl of Tyrconnell, whom James had appointed viceroy (i.e. Lord Deputy) in 1687. Tyrconnell was from an Old English (Norman) family and therefore catholic. He had re-admitted catholics to the Irish Parliament and public office, and had replaced protestant officers with catholic ones in the army. Tyrconnell, and Irish catholics in general, stayed loyal to James and many Irish protestants hesitated to declare themselves openly for William. Tyrconnell took action against those who did, and by November 1688 only the protestants of Ulster were still resisting. Two of the Ulster towns, Enniskillen and Derry, were to become the focal points of the first stage of the Williamite war. When the Dutch invasion threatened, James asked Tyrconnell to send some reliable Irish troops to England. These units sailed to Chester in September and early October 1688. To replace these units, Tyrconnell ordered four new regiments to be raised, one for each Irish province. The Ulster regiment was to be raised by the Earl of Antrim, a catholic nobleman of Scottish origin. Antrim, already in his seventies, hired 1,200 Scottish mercenaries (i.e. redshanks), making sure they were all catholics. The unit was supposed to be ready on 20 November, but delays occurred. At that time Tyrconnell's remodelling of the Irish army had advanced so far that few units still had significant numbers of protestant soldiers. One of those was the regiment of Viscount Mountjoy, a protestant loyal to James. This unit was in garrison at Derry. Tyrconnell considered this unit unreliable and on 23 November he ordered Mountjoy to march to Dublin supposedly for embarking to England but in reality just to get it out of Ulster where many protestants lived. Mountjoy's regiment was to be replaced by Antrim's, but that was not ready and Derry found itself without garrison. When Antrim finally got his troops on the way, he met Colonel George Philips at Newtown Limavady, who sent a messenger to Derry to warn the city. On 7 December 1688, with Antrim's regiment ready to cross the Foyle River under the Ferryquay Gate, thirteen apprentices seized the city keys and locked the gates. With this act Derry was in open rebellion against Tyrconnell and his master James II, who was already in exile in France at that time. Antrim was not strong enough to take the town by force and retreated to Coleraine. Later generations have often seen the shutting of the gates by the apprentices as the start of the siege. In reality six peaceful months passed between the apprentices' action (7 December 1688) and the start of the siege (18 June 1689). In a similar way Lundy's blunders, flight, and supposed treachery (see further down) are often telescoped into the days of the apprentices' action, while in reality they fall into the lead-up to the siege in June 1689. On 9 December Philips came into town. As he had been governor of Derry and Fort Culmore under Charles I, the citizens gave him the keys and accepted him as de facto governor. When Tyrconnell heard that Antrim had been kept out of Derry, he stopped Mountjoy on his march to Dublin and sent him back to Derry. On 21 December Mountjoy reached Derry and struck a deal with the city, according to which two of his companies, consisting entirely of Protestant soldiers, would be let into town. The one was commanded by Lieutenant-Colonel Robert Lundy, the other by Captain William Stewart. [b] Mountjoy appointed Lundy governor of the town in place of Philips. Tyrconnell upscaled his efforts to bring Ulster under his control and on 8 March 1689 sent Lieutenant-General Richard Hamilton with an army of 2500 from Drogheda into north-east Ulster. On 14 March Hamilton defeated the protestant Army of the North at the battle called the Break of Dromore in County Down. In the meantime, on 12 March 1689,[c] James had landed at Kinsale (on Ireland's south coast) with a French fleet of 30 men-of-war commanded by Jean Gabaret. He travelled on the flagship, the Saint Michel. He was accompanied by d'Avaux, the French ambassador, many English and Irish exiles, and about a hundred French officers. He brought with him money and equipment, but few troops. French troops were needed on the continent for the Nine Years' War and were not considered necessary in Ireland as Tyrconnell had already raised a large army and only lacked equipment and the money to pay the men. From Kinsale James proceeded to Cork where he met Tyrconnell. He left Cork on Wednesday 20 March and entered Dublin on Palm Sunday 24. He took up quarters in the castle and established his council on which sat d'Avaux, Tyrconnell, Melfort, de Rosen, and Bishop Cartwright. Hearing of James's arrival in Ireland, Derry prepared to defend itself. On 21 March 1689 Captain James Hamilton arrived from England with two ships: the frigate HMS Jersey and the merchantman Deliverance, bringing gun powder, munition, weapons, and £595 of money for the garrison. James Hamilton was a nephew of Richard Hamilton but fought on the other side. These provisions were to be crucial during the siege. He also brought the commission from King William and Queen Mary that confirmed Colonel Lundy as Williamite governor of the town. Lundy swore the oath of allegiance to William in the cabin of the Jersey. That same day the town committee decided to build a ravelin, or outwork, in front of the Bishops Gate. On the 2nd or 3rd of April Major-General Jean Camus, Marquis de Pusignan, marched north with five regiments of foot. This brought the number of troops in the north to about 12000. James followed on 8 April, accompanied by d'Avaux and Melfort. On 13 April cavalry forming part of the Jacobite vanguard was approaching Derry from the south-west. Lundy called a council of war that decided to defend the passes on the River Finn, a left-hand tributary of River Foyle to the south of Derry, near Strabane. On 15 April the Jacobites attacked that line of defence. Hamilton attacked at the bridge at Clady, which was held by Colonel Skeffington. The engagement that followed is called the Battle of Cladyford. Hamilton's cavalry swam through the river and the protestants abandoned their position and fled. In the meantime the English sent reinforcements to Derry. On the very day of the Battle of Cladyford, 15 April 1689, Colonel Cunningham and Colonel Richards arrived on Lough Foyle with the fourth-rate frigate HMS Swallow, commanded by Captain Wolfran Cornewall, and nine transport ships carrying two regiments, together about 1600 men. Cunningham, who was in charge, had been instructed to take his orders from Lundy, the Governor of Derry. Lundy was panicked by his experience of the Battle of Cladyford and was convinced that the town was lost. On 16 April Lundy held a council of war with Cunningham and Richards from which he excluded most of the local commanders. He proposed that the troops should not land and the town should be abandoned pretending that there were insufficient provisions to defend it. The proposal was accepted by all present. Lundy kept this resolution secret, but the people in town could see that many of the gentry and officers that had been present in the council prepared to leave and went down to the river to board the ships. Cunningham's fleet waited for him still on 17 April but then left, apparently without him. The ships stopped over at Greencastle on 18 April and sailed for England on 19 April. Finally, Lundy left the city disguised as an ordinary soldier and took a ship to Scotland. Having broken through the passes, Hamilton reached Derry on 18 April and summoned the city to surrender. The city asked for a delay of two days before a parley. They also insisted that the Jacobite army should halt at St Johnston and not come nearer. However, when King James joined up with the army, de Rosen suggested he should appeal directly to his subjects in the town: they would surely submit to the king. The effect was the contrary. The men on the wall seeing them approach interpreted this act as a breech of their agreement with Hamilton and when James and his retinue rode up to within 300 yards of Bishops Gate and summoned the city, cannons were fired at them. According to a later account, he was rebuffed with shouts of "No surrender!" and one of the king's aides-de-camp was killed by a shot from the city's largest cannon, the "Roaring Meg". James would ask thrice more, but was refused each time. That same day Adam Murray reached the town. He and his cavalry unit had been part of the protestant Army of the North and had fought at Cladyford. He came from Culmore along the river, broke through the still quite loose ring formed by the besiegers around the town and reached Shipquay Gate, which Captain Morrison opened for him. On 19 April the town council appointed Baker governor of Derry. Baker put George Walker in charge of the stores. James returned to Dublin with de Rosen and left the forces before Derry under the command of Lieutenant-General Jacques de Fontanges, Count Maumont. However, Richard Hamilton also stayed and was of equal rank. Both had been promoted Lieutenant-General quite recently. There have sometimes been frictions between the Irish and the French officers about who was in command. On 21 April the besieged, led by Murray, sallied and killed Count Maumont. This has also been called the Battle of Pennyburn. Command devolved to Richard Hamilton. On 23 April Fort Culmore, which guarded the mouth of River Foyle, surrendered to the Jacobites. During another sally, on 25 April 1689, the Duke of Berwick and De Pointis were wounded and Pusignan killed. On 6 May Brigadier-General Ramsay attacked the Windmill Hill before the Bishops Gate and drove out the sentinels posted there by the besieged, but Baker knew the importance of this position and on the next day the besieged sallied from the Ferryquay Gate and retook Windmill Hill. Ramsay was killed and other officers taken prisoners. Baker built a line of earthworks from the river up to the Windmill Hill and back through the Bog to the river downstream of the town. On 7 May Williamite England formally declared war on France. This officially sanctioned what was already happening around Derry since 18 April. Two French generals, Maumont and Pusignan, had already been killed in the siege. France never had declared war on England as they still saw James as the rightful king and the Williamites as mere rebels. On 11 May a French fleet landed more equipment and troops at Bantry Bay in southern Ireland and fought the naval Battle of Bantry Bay against an English fleet that wanted to prevent the landing. On 30 May heavy guns and mortars arrived at the camp before Derry. Before that date the besiegers only had field artillery. Lord Louth and de Pointis were in charge of the mortars, which were placed on the right-hand bank of the river where no sally could reached them. The mortars shot almost 600 explosive shells into the town during the siege. About this time disease and hunger took hold within the city. It became evident that the town needed to be relieved. William gave that task to Major-General Percy Kirke, who decided to first explore the mouth of River Foyle to find out whether ships could get through to Derry. He sent the engineer Jacob Richards, son of Solomon Richards, mentioned earlier, with three ships: the small (sixth-rate) frigate HMS Greyhound an two ketches. They sailed from Hoylake on 13 May 1689 and explored the mouth of River Foyle on 8 June. However, Greyhound ran aground near Fort Culmore and was damaged by cannon shot before she got afloat, escaped and after some make-shift repairs limped back to Greenock in Scotland to refit. Observations and information obtained from the inhabitants confirmed that the besiegers had placed a boom across the river. Indeed, on 3 June, the besiegers, led by de Pointis had placed a boom across the River Foyle about halfway between Derry and Culmore. On 17 May 1689 Major-General Percy Kirke sailed from Liverpool with 24 transport ships and 3 men-of-war (HMS Swallow, HMS Bonaventure, and HMS Dartmouth). The fleet carried four regiments (about 3000 men: Kirke's own, Sir John Hanmer's, William Stewart's and St George's). The last two were the same regiments as those that should have landed with Cunningham. The convoy arrived in Lough Foyle early in June. On 4 June Hamilton ordered to storm the town. The Jacobites attacked the earthworks and passed over them in some places but were beaten back. Kirke thought that he did not have enough troops to challenge the besiegers in battle and the incident with the Greyhound seemed to show that it was very risky to approach the town by the river. In order to accelerate the siege, James replaced Hamilton with de Rosen at some time between 17 and 24 June from Dublin. On 21 June Berwick was sent south with a detachment to keep the Enniskilleners away. De Rosen intensified the bombardment and had a mine dug under a bastion. At the beginning of June, Governor Baker fell ill and on 21 June a council was held to choose a successor. Baker was consulted and chose John Mitchelburne. On 30 June Baker died and Mitchelburne became governor of Derry. On 2 July de Rosen herded protestants from the surroundings under the wall. The besieged responded by threatening to kill prisoners. Hamilton reported this event to James, who disagreed with de Rosen's measure and called him a "barbarious Muscovite". Frederick de Schomberg, having been appointed commander-in-chief by William, ordered Kirke to attack the boom. Thereupon, on 28 July 1689, Kirke sent four ships to the mouth of the River Foyle to try to bring food into Derry. These were HMS Dartmouth and three merchant ships: Mountjoy from Derry, and Phoenix from Coleraine, and Jerusalem. Dartmouth, under Captain John Leake, engaged the shore batteries, while Mountjoy, commanded by her Master Michael Browning, rammed and breached the boom, whereupon Mountjoy and Phoenix sailed up to Derry, unloading many tons of food. Seeing that he could no longer starve out Derry and not having enough troops to storm the town, de Rosen decided to raise the siege. On 1 August 1689 the besieged discovered that the enemy was gone. On 3 August Kirke reported the lifting of the siege to London. On 31 July 1689 another Jacobite army had been defeated at Newtownbutler by the Enniskilleners. The city had endured 105 days of siege, from 18 April to 1 August 1689. Some 4,000 of its population of 8,000 are said to have died during this siege. 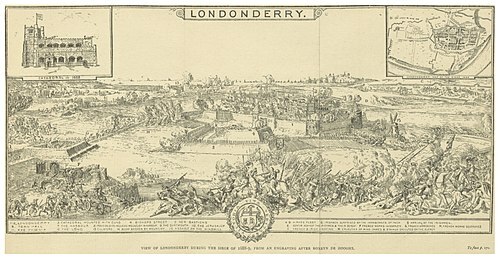 The Siege of Derry, like the battle of the Boyne, is part of Northern Irish protestant folklore. The siege is commemorated by two parades: the Shutting-of-the-Gates Parade and the Relief-of-Derry Parade. The shutting of the gates by 13 apprentices, which happened on 7 December 1680, is commemorated each year on the first Saturday of December, dubbed "Lundy's Day". The commemoration is organised by the Apprentice Boys of Derry, a protestant association. The day usually starts with the firing of one and then three cannon shots, meaning 13, from the walls at midnight on Friday. Then follows the ceremony of the touching of the four original gates: Bishops Gate, Butchers Gate, Shipquay Gate, and Ferryquay Gate. On Saturday, first the members of the Apprentice Boys clubs domiciled outside the walls march to the Apprentice Boys Memorial Hall. Then the assembled members march through the city from the Hall to St. Columb's Cathedral where a thanks-giving service is held. After the service a wreath is laid at the Siege Heroes Mound in the cathedral grounds. Finally, Lundy is burned in effigy as a traitor. The end of the siege, which is taken to have happened on 1 August 1689, old style, when the besieged discovered that the besieging troops had left, is celebrated by the Relief of Derry parade, usually held on the second Saturday of August. This day is chosen because it usually is near 11 August, which is the new style equivalent of 1 August. This parade is one of the events of the week-long Maiden City Festival. In 1969 a confrontation between protestants and catholics during the Relief of Derry parade started the Battle of the Bogside, but recent parades have been largely peaceful. 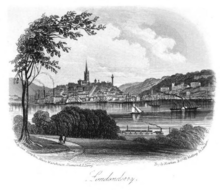 Nineteenth century view of Londonderry prominently showing the Walker's Pillar. Walker's Pillar was built 1826-1828 on the Royal Bastion. The monument consisted of a column crowned by a statue of George Walker. In the night of 27 August 1973, it was blown up by the Provisional IRA. The plinth remains. The Browning Memorial Plaque is affixed to the city wall on Guildhall Square. It commemorates Michael (or Micaiah) Browning, the Master of the Mountjoy. The top shows his ship, the Mountjoy. The inscription below cites the passage about his death in Macaulay's History of England, which calls his: the most enviable of all deaths. We'll guard old Derry's Walls. ^ During the period covered in this article, England, Scotland and Ireland used the Julian Calendar (i.e. Old Style), whereas France and the Netherlands used the Gregorian calendar (i.e. New Style). The difference was 10 days at the given time. See Old Style and New Style dates. ^ Most authors agree that James landed on 12 March, but FitzJames, the Duke of Berwick, gives this date as 17 March. ^ Childs 2007, p. 3, line 14: "To strengthen his forces in the face of the Dutch threat, James ordered the better elements of the Irish Army into England. One regiment of dragoons, a battalion of Foot Guards, and Anthony Hamilton's and Lord Forbes's battalions of line infantry, a total of 2,964 men, sailed to Chester during September and early October." ^ Childs 2007, p. 3, line 19: "The latter unit, commanded by Alexander McDonnell, Third Earl of Antrim, was intended to enter the field by 20 November." ^ Childs 2007, p. 3, line 23: "Tyrconnell, on the other hand, did not want an unreliable battalion in such a key post so, on 23 November, he ordered it to England via Dublin." ^ Macaulay 1855, p. 143 bottom: "a regiment of twelve hundred Papists commanded by a Papist, Alexander Macdonnell, Earl of Antrim, had received orders from the Lord Deputy to occupy Londonderry." ^ Bagwell 1896, p. 174, right column, top: "Lord Antrim's regiment of highlanders and Irish appeared at Newtown Limavady on 6 Dec. and Philips at once wrote to Alderman Norman to put the people of Londonderry on their guard." ^ Macaulay 1855, p. 145: "seized the keys of the city, rushed to the Ferryquay Gate, closed it in the face of the King's officers, and let down the portcullis." ^ Joyce 1903, p. 213: "Lord Antrim marched to take possession of Derry; but while the aldermen and magistrates were hesitating, a few of the bolder young apprentices seizing the keys, locked the town gates on the 7th of December 1688, and shut out Antrim and his Jacobite forces." ^ Bagwell 1896, p. 174, left column, bottom: "From June 1681 to September 1684 he was governor of Culmore Fort"
^ Witherow 1879, p. 199: "in pursuance of an arrangement with Mountjoy of the 21st of December, the citizens of Derry had admitted a part of his regiment to garrison their town." ^ Chichester 1890, p. 204, left column: "Tyrconnell despatched Hamilton with 2,500 troops to make head against the Ulstermen and the news of his having driven them back from Dromore to Coleraine greeted James on his entry into Dublin on the 24 March 1689." ^ FitzJames 1778, p. 47: "une escadre de trente vaisseaux de guerre, commandés par M. de Gabaret." ... "nous arrivâmes à Kingsale le 17 Mars." ^ Witherow 1879, p. 55, bottom: "On Tuesday the 12th of March, King James arrived from France at Kinsale, but contrary to the expectations that the Irish had formed, he was accompanied by only eighteen hundred men; by some accounts, still less." ^ Anonymous 1689, p. 26 higher: "King James landed at Kingsale on Tuesday March 12,"
^ Anonymous 1689, p. 26 lower: "on Wednesday the 20th set out from thence,"
^ Wills 1841, p. 328: "James Hamilton afterwards Earl of Abercorn, who brought to its [i.e. Derry] relief from England a quantity of arms and ammunition, with five thousand pounds in money. " ^ MacGeoghegan 1763, p. 738: "Le capitaine Jacques Hamilton(a) ... [footnote](a) il étoit neveu de Richard Hamilton, qui commandoit ce siége pour le roi, ..."
^ Walker 1690, p. 14"March 20. Captain James Hamilton arrived from England, with Ammunitions and Arms, 480 Barrels of Powder, and Arms for 2000 men, and a Commission from the King and Queen for Col. Lundy to be Governour of the City, ..."
^ Aubert de la Chesnaye des Bois 1771, p. 457: "Jean Camus, son fils aîné, Marquis de Pusignan, Lieutenant-général des armées du Roi, fut tué à la tête du Régiment de Languedoc en 1689." ^ Lainé 1819, p. 127: "La seigneurie de Pusignan, en Dauphiné, érigé en marquisat en novembre 1678 en faveur de N... Chauderon, lieutenant-général de Fauconnerie, échut par sa mort à Géneviève Chauderon, sa soeur, qui avait épousé Imbert Camus, seigneur de Bayols, qui du chef de sa femme devint marquis de Pusignan." ^ MacPherson 1775, p. 178: "which made in all, with the other troops that were already in the North, eleven thousand nine hundred and seventy-eight foot"
^ MacPherson 1775, p. 181: "He parted from Dublin the 8th day of April,"
^ FitzJames 1778, p. 47: "De là nous marchâmes, le 15 Avril, au pont de Clady, sur la rivière de Strabane, dont les Rebelles, au nombre de dix mille, vouloient défendre le passage"
^ Wauchope 2004, p. 889: "At the battle of the Fords (15 April) de Rosen and Hamilton made separate attacks on Lundy's positions on the rivers Finn and Foyle and forced Lundy's troops back to the city." ^ Witherow 1879, p. 93: "Colonel Cunningham and Colonel Richards arrived in Lough Foyle from England, with nine ships and a man of war, conveying two regiments, consisting of 1600 men." ^ Witherow 1879, p. 105: "The ships, after lingering in the Lough to pick up such officers and gentlement as chose to desert, fell down to Greencastle on the 18th, and on the morning of the 19th set sail for England." ^ O'Kelly 1692, p. 33: "but he was little surprized when, instead of Submission, they shott a Shower of Arrows against him, which wounded Some of his Attendants, and it was not then doubted but they aimed chiefly at his royall Person." ^ "Siege of Londonderry in 1688". Gentleman's Magazine (volume 96). London: John Nichols & Son. p. 606. ^ Childs 2007, p. 85: " on 19 April the remodelled town council offered the position to Major Henry Baker"
^ Bouillet 1848, p. 82: "Cette branche a produit Jacques de Fontanges, comte de Maumont, lieutenant-général des armées." ^ Walker 1690, p. 21: "they killed above 200 of the Enemies Souldiers, besides Mamow the French General"
^ "De Paris le 21 May 1689". Gazette de France (in French) (21). 21 May 1689. p. 236. Le sieur de Maumont, Capitaine aux Gardes, Lieutenant Genéral en Irlande a esté tüé au siége de Londonderry. ^ Witherow 1879, p. 128: "Brigadier Ramsay, in an attempt to rally his men and bring them up again to renew the encounter, was slain." ^ MacPherson 1775, p. 200 top: "The great guns and mortars arrived not at the camp, till the thirtieth of May, and till then little was done against the town, except beating them back when they ventured to sally with what guns we had upon them, "
^ Witherow 1879, p. 138: "from the 2nd of June the large shells began to come, and then, when the supply of these seemed exhausted, about the first week of July, the besiegers returned to the small shells again. Between the 24th of April and the 22nd of July they cast into the city 587 bombs, of which 326 were small and 261 were large." ^ Childs 2007, p. 113: "a reconnaissance expedition left Hoylake on 13 May comprising HMS Greyhound (sixth rate, Captain Gwillam), HMS Kingfisher (ketch, Captain Edward Boyce) and a merchant ketch, the Edward and James (Master Mr Meers)." ^ MacPherson 1775, p. 200 bottom: "The English on the eight of June sent a small frigate, the Grayhound"
^ Witherow 1879, p. 141: "They set sail from Liverpool on the 17th of May; but were delayed by contrary winds." ^ "De Londres, le 25 Iuillet 1689". Gazette de France (in French) (32). 30 July 1689. p. 374. 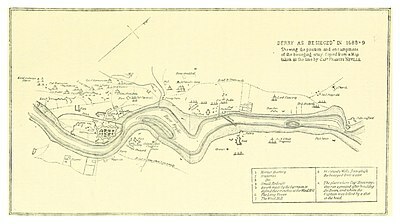 Le Major Genéral Kirk a écrit du lac de Londonderry, qu'il avoit trouvé les Irlandais si bien retranchez sur les deux bords de la rivière, où ils avoient dressés deux bateries de vingt quatre livres de balle pour défendre les estacades qui la traversent qu'il lui avoit esté impossible de forcer le passage. Que comme les troupes qu'il commande n'estoient pas assez nombreuses pour faire le débarquement, il n'avoit osé le tenter de peur de les trop exposer. ^ MacPherson 1775, p. 201: "The mareschal de Rosen arrived in the camp before Derry the 17th,"
^ Walker 1690, p. 29: "June 24. or thereabout, Conrad de Rosen, Marshall General of the Irish Forces, is received into the Enemies Camp"
^ Witherow 1879, p. 164: "none but a barbarious Muscovite could have thought of so cruel a contrivance." ^ Macaulay 1855, p. 235: "Just at this time Kirke received a despatch from England, which contained positive orders that Londonderry should be relieved. He accordingly determined to make an attempt which, as far as it appears, he might have made, with at least an equally fair prospect of success, six weeks earlier. "[A note explains this as follows:] "This despatch which positively commanded Kirke to attack the boom, was signed by Schomberg, who had already been appointed commander in chief of all the English forces in Ireland. A copy of it is among the Nairne MSS in the Bodleian Library." ^ Witherow 1879, p. 181: "That day orders were issued by Kirke from aboard the Swallow that three small vessels laden with provisions, under the protection of the Dartmouth, man-of-war frigate, should attempt the passage of the river. The Dartmouth, commanded by Captain Leake, had been ordered round from Carrickfergus for this service; The victuallers were the Mountjoy, of Derry, Capt. Micaiah Browning, a native of the city; the Phoenix, of Coleraine, Captain Andrew Douglas; and the Jerusalem, Captain Reynell. ^ Graham 1829, p. 259: "Early on the morning of the first of August, the garrison sent out a detachment to see what was become of the enemy. They saw them on their march "
^ "Baker Club jewel". Londonderry Sentinel. 13 January 2011. Retrieved 2 August 2014. ^ "Siege hero Walker felled in midnight blast". Derry Journal. 23 July 2010. Retrieved 17 September 2018. ^ Macaulay 1855, p. 236: "...and he died the most enviable of all deaths, in sight of the city which was his birthplace, which was his home, and which had just been saved by his courage and self-devotion from the most frightful form of destruction." Anonymous (1689), Ireland's Lamentation, London: J. D.
Bagwell, Richard (1896), "Philips or Phillips, George (1599?–1696)", in Lee, Sidney (ed. ), Dictionary of National Biography, 45, London: Smith, Elder & Co.
Chichester, Henry Manners (1890). "Hamilton, Richard (fl. 1688)". In Lee, Sidney (ed.). Dictionary of National Biography. 24. New York: MacMillan and Co.
Lainé, Louis (1819). Dictionnaire véridique des origines des maisons nobles ou anoblis du royaume de France (in French). 1. Paris: Chez l'auteur, rue de la Vrillière;. This page was last edited on 21 April 2019, at 12:17 (UTC).